Keep Up-to-Date by "Liking" the Agroforestry and Wildlife Field Day Facebook Page! Agroforestry and Wildlife Field Day is an event designed to inform private landowners, hunters and those in the forestry or agribusiness fields about using their land to maximize all aspects of the natural environment. The date of the next field day is September 20, 2018. Federal and state experts in the fields of wildlife and forest management will be on hand to present the most up-to-date research-based information. 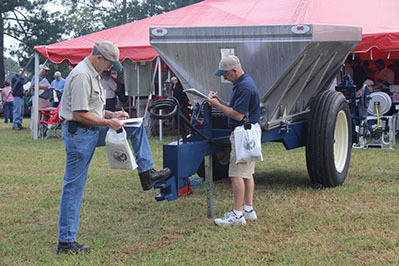 The field day will include both management recommendations and real-life technique demonstrations. Field day participants will be shuttled to field day sites via tram and will receive a take-home booklet that includes expanded topic and speaker information. Registration information coming soon! Registration includes the field day program and lunch. Pre-registrants are guaranteed an Agroforestry & Wildlife Field Day ball cap. Late and on-site registrants will receive a cap on a first come, first served basis. Continuing Education Credits (CEU) are available for several fields, including pesticide (several categories), forestry, logger, arborist and wildlife.